I honestly don’t remember why I said that. I was speaking off-the-cuff. It was just a mistake. People make mistakes. Congress made a mistake drafting the law and I made a mistake talking about it...My subsequent statement was just a speak-o—you know, like a typo. "Finally, the third risk, and the one folks aren't talking about, which may be most important of all, is the role of the states...Will people understand that gee, if your governor doesn't set up an exchange, you're losing hundreds of millions of dollars of tax credits to be delivered to your citizens." The ACA was the most debated and discussed piece of legislation in a generation. 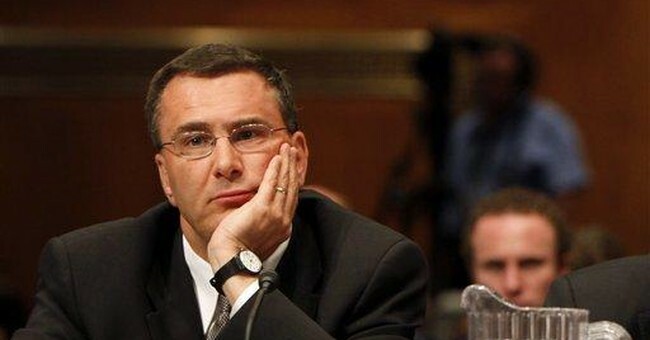 Find me a legislator saying what Gruber said. Go. They said it in the legislation, champ. MT @chrislhayes Find me a legislator saying what Gruber said. Go. Yep. It was in the bill, for which hundreds of Democrats voted. The House version included broader verbiage, but once Scott Brown got elected, Democrats didn't have the votes to revise their legislation. They had to embrace the Senate-passed bill, which specifically barred subsidies for consumers in states that hadn't set up their own marketplaces. One last point: Philip Klein worries that if the court's decision holds, it will create headaches for Republican governors who will come under intense pressure to set up Obamacare exchanges. You're heartlessly taking away people's healthcare! Ramesh Ponnuru isn't so sure that the politics would cut that way. Democrats are solely responsible for the mess they've made, and bitter attempts to blame Republicans for the law's myriad failures have thus far fallen flat.